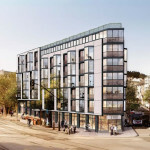 The pre-construction planning for a five-story building with 101 below-market-rate apartments for formerly homeless veterans and low-income families to rise at 1150 Third Street, on the eastern half of Mission Bay Block 3, which fronts Third Street between Mission Rock and Long Bridge, is underway. The $47 million project, which is being developed by the Chinatown Community Development Center and Swords to Plowshares, will provide 50 one-bedrooms for formerly homeless veterans and 51 units for low-income families earning up to 60 percent of the area median income, with on-site supportive services and a garage for 19 cars and 102 bikes. The apartments for the families will be a mix of two-bedrooms and threes, with two-bedrooms averaging 900 square feet and the threes around 1,100. The one-bedrooms will average around 540 square feet. Letty Maytum Stacy Architects is working to finalize the conceptual designs for the project and construction is currently slated to break ground by Fall of 2017, assuming the funding, which is expected to be locked down by the first quarter of 2017, is in place. 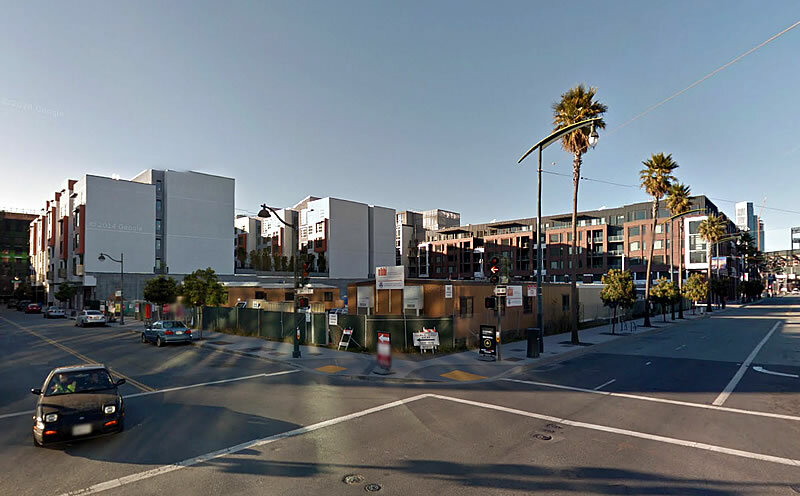 The 147-unit “Venue” sits on the western half of Mission Bay Block 3, fronting Fourth Street. How bout buying every homeless person in SF a house in Detroit instead. They go for about 10K. Would save the city so much money and eliminate the homeless problem. How are you not Mayor, no.. President? Could this actually be legal? It makes sense. When $800k is being spent on a unit of affordable housing in SF you could easily put up 8 times the people in Detroit. This is why I wish SF could annex surrounding communities like NYC did with the 5 boroughs. There they realize it doesn’t make sense to put affordable housing in what is the most expensive and developed part of the city. It would be great if a developer could build affordable housing in Oakland or Fremont to satisfy their requirement. It would be a lot more units of housing too. We at least need an overarching affordable housing agreement with neighboring cities. Right, because what Detroit needs is for us to push all the homeless to their front door. Problem solved! Umm, they wouldn’t be homeless if they had a house there. The plan is legit. Start fresh program, with some monetary assistance, and bring more people to a city that decaying. Gosh, if SF could annex the surrounding communities, there wouldn’t be any poor people in San Franciso. The rich would have the city all to themselves! No, the rich tend to be perfectly happy sharing with the hard-working. It’s those that are neither rich nor hard-working that should not be living in one of the most expensive cities on the planet. I respectfully disagree. Unfortunately Mercy housing and the like do not permit people making 50,000 to 100,000. I think it would be great to interact with school teachers, social workers, construction, etc. I respect people who finished undergrad and/or developed skills for special trade, but do not fall in the high income bracket. By contrast, I suspect that most residents of low income housing did not even finish high school. Frankly, they do not deserve to be living Mission Bay, they don’t need to live here (they can obtain support anywhere), and they are not as interesting or motivated as the aforementioned groups. and yes, people who won’t work don’t deserve to live for free in (by many measures) the most expensive city in america. That is the best idea I have heard yet to solve the homeless problem here. I wish I was kidding. What’s the crazy cost per person currently being spent on homelessness in SF right now… I think it’s close to $60K/year. Whereas in Denmark, they allocate all of their funding to just building low-cost homes for every single person in need. Too many things are backwards in this country. Would all the problems be solved for people like the goofball heroin addict kid in Nevius’ column who moved to SF from Flint, Michigan because the services are so much better? Still an addict. Still disinterested in “rules” and “responsibility”. Or what about “Tree” in Berkeley Doesn’t like any of those square people rules. Demands the right to live in a public park, scattering his junk around the place and defecating in the creek. Should everyone have the automatic right to live in SF? I can’t afford to live in SF, should I become a heroin addict and camp out a few months and automatically get a free apartment? I mean, how is this going to work? Let’s send the homeless to Denmark! Also, let’s be sure the homeless claim to be muslims. That way, they can get right to the front of the line. i guess you are assuming the land was free? don’t forget entitlement cost, permit, developer fee, legal fee, design and engineering, consultant cost, admin, testing, management cost. $800K sadly IS the going rate. There is Mercy Housing right across from this new development on the corner of Channel Street and 4th street for low income and previously homeless people. Once the residents of Mercy Housing moved in, the corner of Channel and 4th street and nearby streets became a breeding ground for drug deals and prostitution. Break ins took place in Azure where average monthly rent is $4000, intruders tried to break into Madrone where property prices are above $1 million. Car break ins are a frequent occurrence. All this criminal activity is happening even though the SF police headquarters are nearby. San francisco politicians are ridiculous. You can’t take the criminal mind out of people by planting them in Mercy Housing and building Mercy Housing near people who live in communities like Azure and Madrone which became easy access for drug addicts to steal to fund their habit. Yes. And there’s no crime in poor neighborhoods. Just move them there. Problem solved. The idea that you can cure drug users and criminals by planting them in mercy housing type of complexes next to developments that offer them an opportunity to intrude and steal is ludicrous. 99.9% of homeless are homeless because they have a mental problem. Planting them in mercy housing without treating their mental illness is ludicrous. The guy who tried to enter Madrone has walked across from the block from mercy housing. Just take a walk on 4th street a block away from Azure and Madrone after dark and you will see shady activities being done by people. None of this activity was this prevalent before mercy housing residents moved in. I think spending $500K per unit is a grossly excessive income transfer, far beyond a robust social net. but are you sure there are documented cases of mercy residents committing crimes? Petty crime is pretty common across many neighborhoods. Other than people standing outside in pajamas smoking cigarettes, I haven’t seen anything out of the ordinary. I’m not sure I read this part of your post correctly, but just to clarify: the Mercy Housing building was completed before Azure, meaning its residents were already there when the residents of Azure moved in – so it would be incorrect to imply that any crime committed against Azure residents started when Mercy Housing people arrived. also, there is a large homeless population in the neighborhood (I live here too) that could be equally as responsible – is there any evidence either way? Keep in mind that some of the high construction cost of affordable housing is driven by the other programs layered onto it: local hiring, LBE contracting, to say nothing of the complex financing. I think it’s terrific we are supporting the Vets! Honestly it’s better for market-rate residents in that neighborhood that there are no high-rise condos coming to that block. Increasing property values in SF, housing for the very poor and the very rich. No one in between! And then people wonder why there’s a huge income divide in the city. For a household of two, 60% of the area median income is about $47,000. Now at the proposed minimum wage of $15/hr, a two person household would be making $60,000 per year and would not qualify for this housing. So we are providing incentive for either one of the people to quit or go part time. That’s right folks, you can drop out of high school, quit your barista job, and still have a sweet pad in the most expensive City in America. Or be like the couple last year?….morbidly obese to the point of disability. No skills. No money. No common sense. Scraping by barely in rural Vermont. HEY! Let’s randomly move across the country to the most expensive city in the United States! And live in our car! And qualify for a free free free apartment in said most expensive city!